Our Candu Jr. Mini Tugboat! This is our Candu Jr. Mini Tugboat! 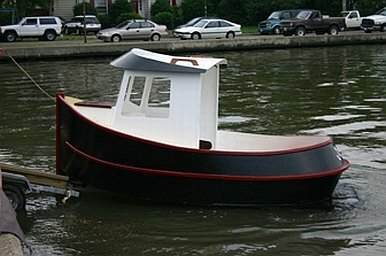 This adorable boat is 11 feet long. 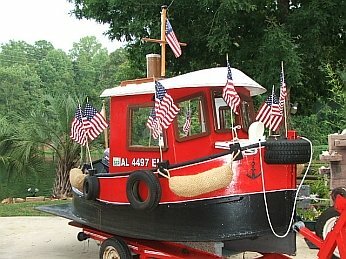 This boat has the traditional "salty" look of a real tugboat. It is built with a box keel, giving it great maneuverability and speed. This boat is fully trailerable, and instructions for the trailer conversion is included in the plans. This boat can be powered with a 15 to 20 HP outboard motor. It will plane at 20 MPH. This is the former "Helen-L". She belonged until quite recently, to John and Helen Bosier of Richland, Michigan. If you go to the Little Bitts Page, you will find the story of her recent adoption by Woody Snell and his wife Laura, of Alabama! She is now called "Tu Quute"! THIS is the former "Helen-L" (above), now aptly named "Tu Quute". She was recently adopted from the Bosiers in Michigan by Woody and Laura Snell of Slapout, Alabama. As you can see, "Tu Quute" is all dressed up in readiness for the local parade! This is the Candu Jr. "Joe". She was built by Terry and Frank Robinson with the assistance of Lafayette River Boatbuilding and a host of friends! The team was led by Joe Filipowski. 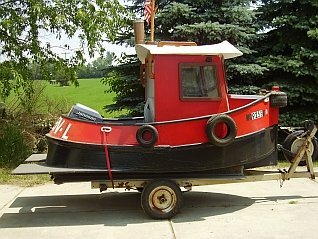 You can see that this mini tugboat has the more traditional salty lines of a real working tug. With a shoal draft of 24 inches, she is able to perform many functions, including environmental recovery work in the headwaters of Lafayette Bay's tidal rivers. She was launched on the Lafayette River in Virginia on May 28, 2005. 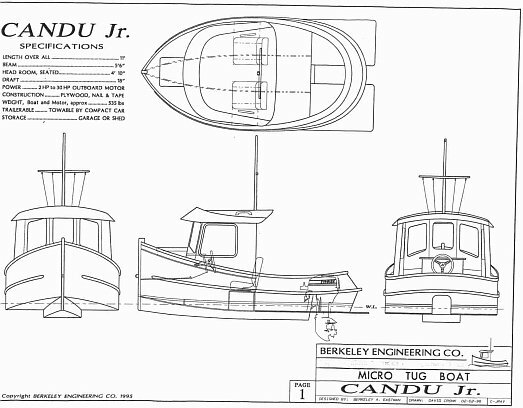 This is the scan of the specification sheet on the Candu Jr. mini tugboat. You may use your mouse and right click on the image, save it to your computer, and then be able to enlarge it to see closer detail. «If you are having trouble making up your mind which mini tugboat to build, click on our Order Page and order a Mini Tugboat information packet. 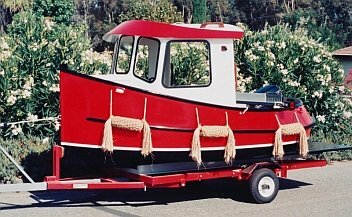 This will give you information about all 4 of our available mini tugboat plans and help you make a decision on which one you would like to order! You may ALSO use the same link to go ahead and IMMEDIATELY order your own set of plans for the Candu Jr!